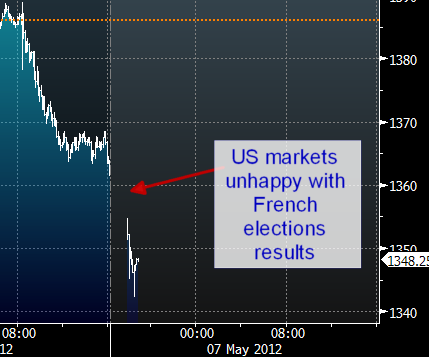 SP500 futures have dropped 14.5 points (over 1% from Friday's close) on the back of the French election results. This brings the US equity market to the lowest level in 2 months. Bloomberg: -- U.S. stock futures fell, following the biggest weekly slump in 2012, after Francois Hollande’s election as France’s president and Greek voters flocking to anti-bailout parties spurred concern about Europe’s debt crisis. Other markets are reacting strongly as well. The euro is down about a percent. Crude oil (WTI) is down $2.40 to $96/barrel, a level not seen since December of last year. A number of people on this side of the pond paid little attention to the French elections. But the US equity markets volatility should act as a reminder of how this event could unsettle the delicate balance of the Franco-German agreements that may now be in jeopardy (see also here and here). Leftist fervor in Europe is bound to generate a rift over austerity between Germany and numerous other nations of the Eurozone, particularly the periphery. And that in turn may put a damper on the Eurozone Fiscal Compact. We are in for some volatility going into this week.